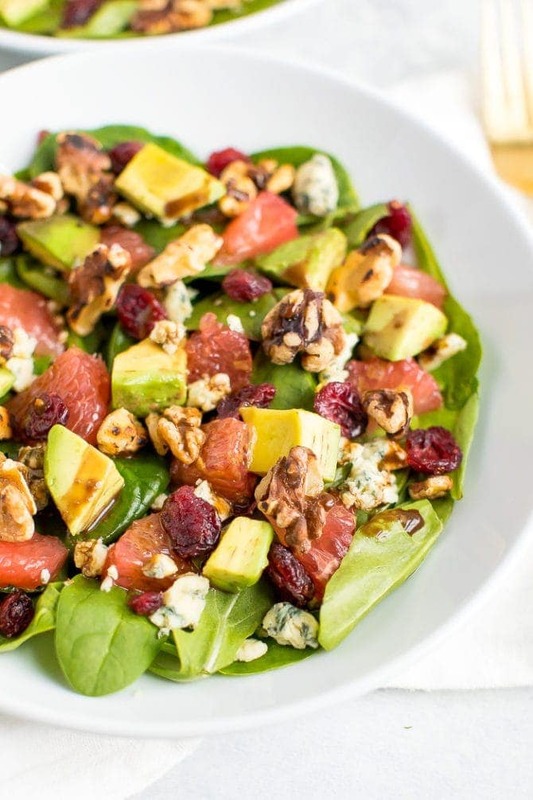 This grapefruit avocado salad is the perfect winter salad with a blend of spicy arugula, creamy avocado, blue cheese and fruit. Serve as a side or add protein to make it the main dish. As some of you might know, I’m a Valentine’s Day baby and for the most part I LOVE it (pun fully intended). It feels extra special to be born on a holiday based around chocolate, hearts, kisses and sweetness, but sometimes it can really stink. When I was younger (and none of my friends had significant others longer than 2 weeks at a time) it was fine, but now it’s quite hard to find a friend that doesn’t already have plans on February 14th. And then there’s the issue of going out to dinner to celebrate. In case you didn’t know, everyone and their brother makes reservations to go out to a nice dinner on Valentine’s Day, most restaurants don’t serve their normal menu and the prices always seem more expensive. Same goes for flowers! So with all that in mind, Isaac and I usually go out to dinner before or after the big day and we just cook at home on Valentine’s Day. This salad came about one year when I knew we’d be staying at home and it was inspired by a recipe that one of my BFs shared with me years ago. 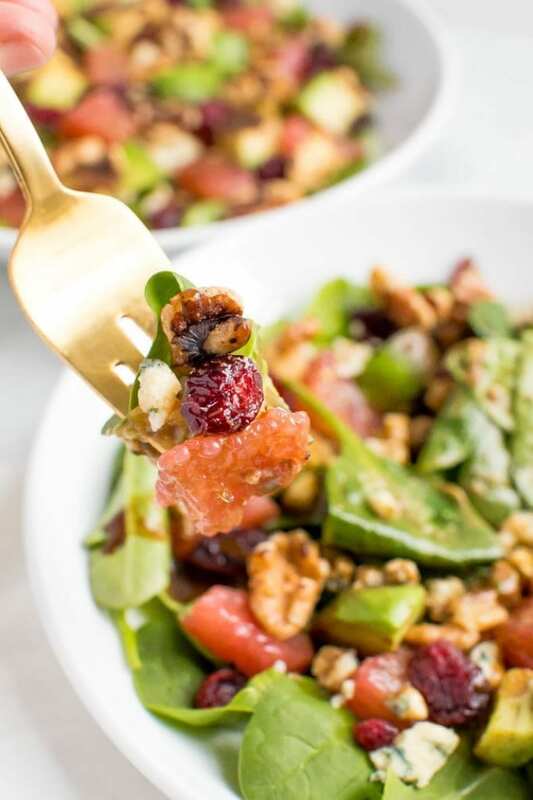 Grapefruit is in season throughout the winter months and the red and pink fits right in with the Valentine’s Day color scheme so if you’re staying in this year, why not make your valentine (or yourself) this delicious salad? 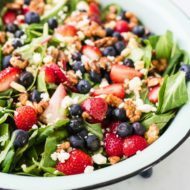 I am betting, you’ll fall head over heels in love with the blend of spicy arugula, creamy avocado, blue cheese and fruit. 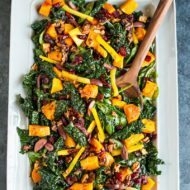 You can serve it up as a first course or side salad OR add some protein and serve it up as your main entree. I think it would be fantastic with seafood — maybe grilled shrimp, scallops or salmon. 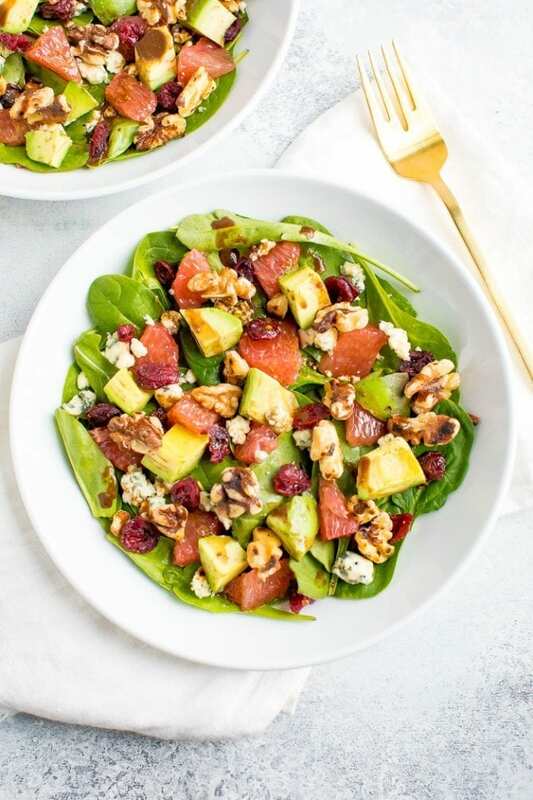 If you try this delicious grapefruit avocado arugula salad be sure to leave a comment and star rating below letting me know how it turned out. Your feedback is so helpful for the EBF team and other EBF readers. 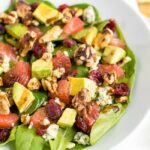 This grapefruit avocado salad is the perfect winter salad with a blend of spicy arugula, creamy avocado, blue cheese and fruit. Serve as a side or add protein to make it a main dish. Divide arugula between two salad bowls. Top each with the remaining ingredients. Serve with balsamic dressing. I’ve never known a 2/14 baby before! I imagine it being a very fun holiday as a kid and a tough one as an adult, as you say. I’m quite romantic but think it’s a bit over-rated….I mean, really, florist, do you need to quadruple the price of flowers?? I’ll be making one a JibJab valentine’s day cards/videos – so funny! Our plan is to probably cook dinner in, and I might bake some treats. Awhh that’s a great birthday to have! And funny you posted this – a valentines day arugula salad is on my menu for the 14th too! I’m doing beets in mine for the red 🙂 my plans are cooking dinner with steve and another couple (heart shaped gourmet pizzas are on the menu) low key and fun! I don’t usually celebrate valentines day so it’s a first this year! I’m going all out and going to a fancy shmancy dinner! I’m not celebrating, but I’m not depressed over it. It’s just another day to me! 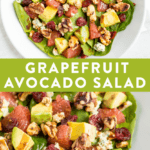 I just made such a similar salad last night and I was so close to putting blue cheese on it but I wasn’t sure how it would go with the grapefruit. Now I’m sad I missed out! Hey, I work at a restaurant and we do not jack up our prices on vday..but we do have several reservations! But your blog is really nice, I love all of the healthy living tips, thank you! Great recipe! Seth and I will be staying in as well, since I don’t get out of class until 8:30PM! I LOVE avocado in salads! That salad sounds like my dream salad. I have such a hard time finding arugula in the grocery story though; I usually have to pick it out of one of those mixed greens packages! wtf? It does seem just perfect that you are a V-day baby. You are just too sweet not to be one! I think Ryan and I are going to stay in too. It is too crazy in Austin on that night. We like to go out before or after the big day to avoid the long waits, busy and tired kitchens, and the traffic! I hope you have a wonderful Sunday…and an even better Monday. Rest, rejuvenate and spread some love! Cute idea! Kyle and I are staying in for V-day this year, and this salad might make it onto the menu. Have fun in NYC! 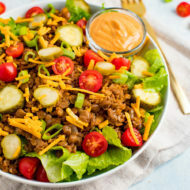 Update. . . . made this salad last night and it was a hit! Thanks for the great recipe! YAY! So glad you enjoyed the salad Lauren!! Happy Valentine’s Day to you! You really can’t go wrong with avocado and blue cheese. Yum! Happy Birthday tomorrow! That salad looks amazing – and I’ll think I’ll have a pre-Valentine’s Day meal of it today! Have a great birthday AND Valentine’s Day!